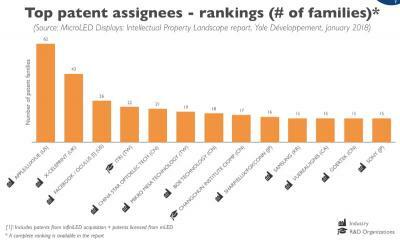 The Korea Intellectual Property Office released a report on the Micro LED industry IP situation - in which it says that Korean display companies may lose their current industry lead as they account for less than 15% of all micro LED display patent applications. The leading countries in Micro-LED IP are China and the United States - which together account for more than 50% of all applications. 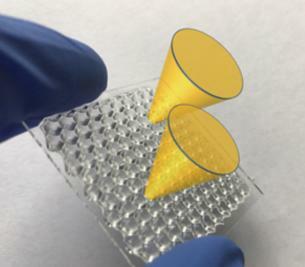 UK-based Optovate announced that it has developed a technology that enables multiple microLEDs transferred in parallel from a wafer to a substrate to be aligned in one step with a precision optical array. Optovate says that this technology is protected in a portfolio of 20 granted and pending patents dating from 2008. The company is now looking for display partners to commercialize its technology. NanoGaN (a subsidiary of UK-based Eipwafer foundry and substrate maker IQE) announced that it has purchased a portfolio of 54 quasi photonic crystals patents from Taiwan's Luxtaltek for $500,000. NanoGaN says that these newly acquired patents have applications in optical components - including Micro-LED displays. Other possible applications are in the fields of vertical-cavity surface-emitting lasers (VCSELs), modulators, silicon photonics, fiber-optic systems, biosensors and more. IQE believes that due to its existing in-house NIL capability, the firm is well positioned to commercialize the new technology. Google was granted a new patent that describes a micro-LED based AR glasses device. This is a patent from March 2016 that was now granted. According to the patent description, the Micro-LED active area is aligned to an array of collimating reflectors that reflect a display image back towards a user's eyes. The patent also describes a similar VR device (in which the displays are not see-through). A few days ago Apple was awarded with 52 different patents, covering a wide range of technologies that include 3D glasses, in-air gesturing, fingerprint sensing and more. One of these patents details a Micro-LED device that is able to both emit and sense light. We have seen similar solutions based on OLEDs - in that case the photo-diodes were placed between the OLED pixels, to create a micro-display that can sense light (possible applications are for example eye-tracking in a VR headset).